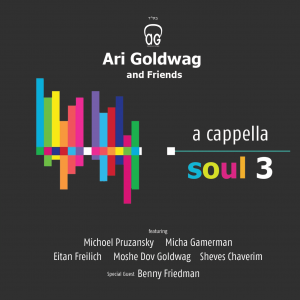 This sefira season we were fortunate again to get another edition of Ari Goldwag’s “A Capella Soul” series. This songs unless otherwise noted were composed by Ari Goldwag. Some of them he sang himself on other albums, some were Sheves Chaverim songs, some he composed for other artists, and others are brand new. This CD is somewhere an “in between” as far as a capella CDs. That is to say there are some a capella CDs that sound almost exactly like music, and there are others that make no attempt to sound like music and instead rely on harmonizing (like the Kumzitz in the Rain CDs, Miami Around the Campfire, etc.) Ari Goldwag does use his voice to do melodies and rhythm, and he claps for percussion, but there is no mistaking this for music. In that he reaches a good balance that allows him to make more upbeat songs while still sounding a capella. Ari Goldwag is a brilliant composer, and I’ve always thought underrated, but thankfully he is getting more and more recognition these days. He also has a beautiful voice and a knack for matching songs with other artists. His son Moshe Dov is featured on numerous songs, and each album he is on he sounds better and better and is developing into quite the star in his own right. I still wait for the day that a father-son Goldwag album comes out- there’s almost enough songs already at this point. Hint, hint! This upbeat song was composed for the honor of Ari Goldwag’s daughter, Naama. It was a clever choice as the lyrics use both the words “Noam” and “Orah”. Throughout the song, he sounds as though he genuinely has a big smile on his face in a non-stop clap-along song. Ari Goldwag and the very talented Michoel Pruzansky sing this beautiful slow song together. The mood is more serious and prayerful, and this song like the last one makes me appreciate how much feeling is put into each song. The background “music” in this song is more simple, which I generally prefer, sometimes sounding just like harmonies. Some beautiful notes are hit in this song by both singers. This song is a duet between Ari Goldwag and Ian FreitorI am not sure how I haven’t heard this song before, but I love it. Its a fun yet gentle song that is guaranteed to put a smile on your face and it works remarkably well in a capella version (though of course the music version will always bring something special). This is one of my favorites on the album and I am anxious to listen to the other version once I can. I keep the second half, so when writing this, I still have a bit more time without music. Wow, where have I been? I seem to have missed another very good album by a new artist. This is one I plan to buy in a few days… Micha Gamerman is from Brazil, and at least in this song sings with a Sephardi accent. The song is in Ivrit and the lyrics are by Ari Goldwag, Miriam Israeli, Yitzy Berry, and Micha Gamerman. I love how Ari Goldwag’s voice goes with Micha Gamerman’s …Goldwag has a more smooth slightly higher voice and Micha’s has a bit of gravel to it. Awesome song and another one of my favorite’s on the album. This song is sung here by Benny Friedman, Ari Goldwag, and Moshe Dov Goldwag. I loved Ari Goldwag and Benny Friedman’s collaboration on the last A Capella soul via Am Echad, Min Hameitzar. Moshe Dov is a wonderful addition to the duet and this is hands down my favorite song on the album. Beautiful, stirring, and one I hope to hear around Shabbos tables. Lehisaneg is not a song I hear often anyway- maybe it is more common in other circles- so I hoep that this tune can make it more popular and have the same effect as Ari Goldwag’s “Kah Ribon”. This song was from one of Ari Goldwag’s quite a while back, the same album that brought us “Aleinu”. Its another upbeat but laid back song. I especially like the background vocals on this song and think it was a good choice to revamp in a new style. This song is in honor of one of Ari Goldwag’s other daughter’s, Tziporah. In contrast to Vihi Noam, its a very slow, delicate moving song. Vocally, this is one of hte best songs on the album, and it is overall an enjoyable pleasant listen. Here’s a throwback! An awesome father-son duet on this beautiful English song. What a neat choice. I love this song and this version is great. So happy to have this song featured here! This was my favorite song from Sheves Chaverim. Its super catchy and a great sing-along and I can’t get enough of either version. I will say that I thought less “music” could have been added to this; it sounds a little cluttered because there was already the clapping and the “oOooOoo” by the boys. From a happy fun song we go to a deep, serious song. This sounds like we are getting a direct glimpse into Ari Goldwag’s tefillos. Besides Lishuascha, which is more mid-tempo, this is probably my favorite slow song on the album. Just gorgeous. If you haven’t heard this song…where have you been!?! This is version 3.0; a capella of course, and a mix of Ari Goldwag and Sheves Chaverim, and a mix of English and Hebrew. Even will make you move in the a capella version. Such a fun song and a great way to end the album … until next time! In short, another quality production by Ari Goldwag who never disappoints. Great compositions and vocals and excellent choices of people to join him. Worth a listen even when “real” music allowed.